At that moment when you are very angry and want to throw out your anger, install this addon. It adds two very terrible mobs which are an excellent alternative for standard bosses in Minecraft PE. In this version, you can only fight with two pumpkin creatures that will beat you without stopping. In the first case, you need to build a sculpture for summoning golems and then rush to an advantageous position where you can defeat the enemy with effort. In the second case, you just need to find or spawn a creeper. It's not just got the basic model of the creeper, so wait for a powerful explosion if you stand next to it. As you can see, both mobs will never become your friends, but they are very good at checking weapon skills. The Pumpkin Bosses addon is recommended for those who want to fight well. 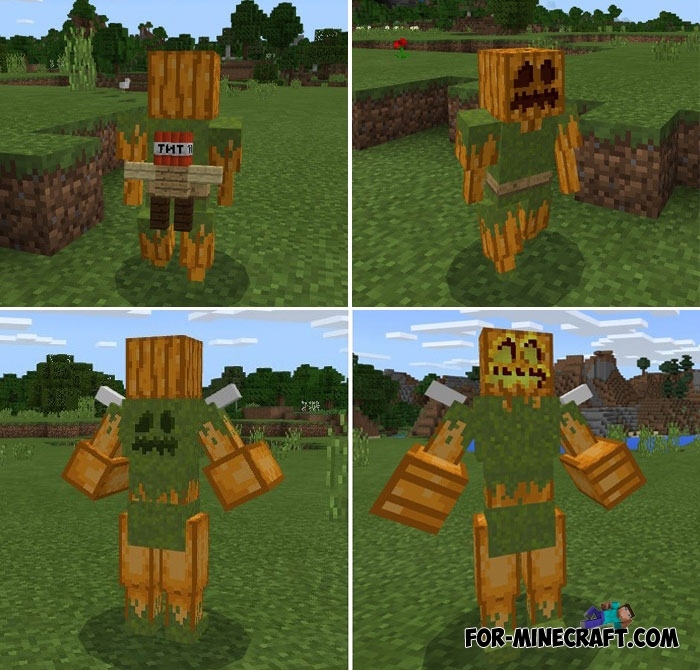 How to install the Pumpkin Bosses addon?